A virtual studio for Android, connecting simple audio tools, Pd patches, or whole apps. 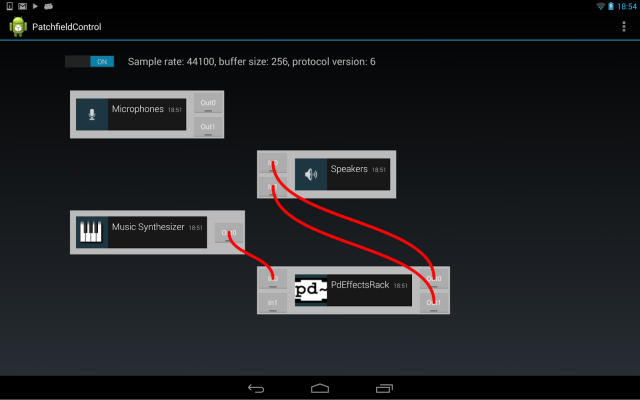 Android audio users, developers, patchers, and musicians just got a huge gift. Patchfield is, as the name implies, a space in which you can connect synths, effects, and sound modules in an open, modular environment. It’s a free app you can use on its own, as well as a free architecture developers can use in their apps. Inside an app (as a service), Patchfield provides a set of tools developers can use to make more robust apps for Android, with lots of nifty patching and performance optimization goodies built in. That could mean that you provide modular routing in your music app, for instance, or that you use Patchfield as the basis for a modular sound and music environment. As a service for other apps, Patchfield also provides inter-app routing capabilities, the likes of which we’ve seen in tools like JACK (on desktop and iOS) and Audiobus (on iOS). And it can be a tool in which simple tools – or, say, Pd patches – can work together. Just as was the vision of many developers working with JACK, the idea is that you can create simple one-task sound creations and connect them together – think of a set of stompboxes – rather than big, monolithic apps. Running as a remote service, Patchfield allows audio developers to create interoperable apps that focus on a single task each, such as synthesis or effects or recording. The output of one app can be connected to the input of another, for a combinatorial explosion of possibilities. Running locally within a single app, Patchfield provides a powerful way of organizing the audio components of an app. The implementation resides entirely in user space and works on many stock consumer devices, such as Nexus 7 and 10. Patchfield is available at GitHub, under the the Apache 2.0 License. The repository includes the core library as well as a number of sample projects that illustrate how to use Patchfield. Happy hacking! Patchfield is the 20% project of Google’s Peter Brinkmann, who is also the lead developer of libpd. And that means Patchfield is also a very powerful environment for users of the free and open source Pd (Pure Data) environment to combine simple patches on an Android device. Speaking of Pd and Android, the free PdDroidParty – which makes it easy to drop patches on a mobile device – this week added MIDI input. Plug in a MIDI controller or keyboard into a supported Android tablet or phone (like the Novation keyboard we covered yesterday), and you can play a Pd patch. A warning that none of this is exactly end-user friendly just yet, because there aren’t yet enough tools for the environment to make it useful. But that situation could change precisely because it is friendly to tinkerers and developers – even the casual, evening-hobbyist types. If you’re thinking of picking up an Android device with decent audio performance, I’m hearing good things about the second-generation Asus Nexus 7 tablet – enough so that I may grab one myself. (You’ll notice that’s what Peter is using in the video.) At about $200 / €200, it’s not too expensive, either. If you do tinker around with this, let us know.